Tuesday February 26th 1884 I got the ironing done by four oclock besides doing what other work I had to about the house. Mother was in town after dinner and came home with the word that Hatt was sick in bed. I went over after supper to stay all night weather warmer today. Wednesday February 27th 1884 I worked at Hatts till about ten oclock and then came on home she is better this morning. I worked about house the rest of the day and sewed a little in the evening. Weather colder again. 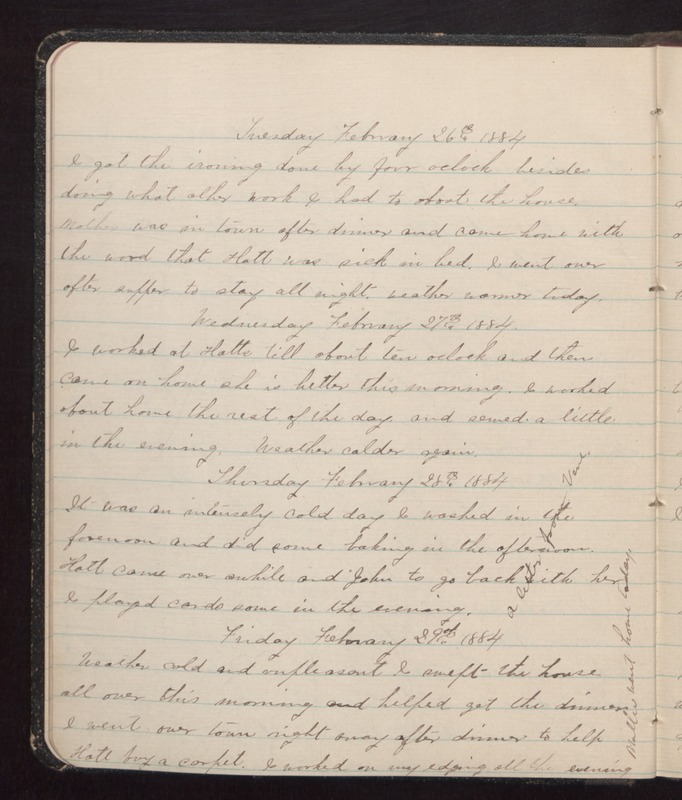 Thursday February 28th 1884 It was an intensely cold day I washed in the forenoon and did some baking in the afternoon. Hatt came over awhile and John to go back with her. I played cards some in the evening. Friday February 29th 1884 Weather cold and unpleasant. I swept the house all over this morning and helped get the dinner. I went over town right away after dinner to help Hatt buy a carpet. I worked on my edging all the evening. Mother went home today.